Musings- BANKS are big beneficiaries of Trump’s Tax Policy and guess who else ? For our September General Meeting, our local Swing Left coordinators, Cynthia Spring Pearson and Kurt Anderson, are going to speak about Swing Left’s efforts here in Riverside. • What District the Riverside Swing Left has targeted and why. • What folks can do as volunteers to help Swing Left’s efforts. 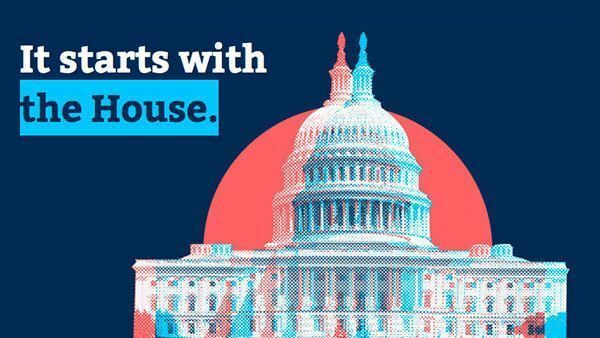 The 2018 midterm elections are the next best chance for progressives to regain power in our government—by taking back the House of Representatives. The House of Representatives has 435 seats, 64 of which we consider competitive. These are the Swing Districts, where Congress is won and lost. To get a say in our government, we’ll need to win about 66% of them. Riverside is within 50 miles of 5 of these winnable districts. In addition to these speakers, we also hope to have a firm date for our planned citizenship classes, efforts to save DACA, a vote on early recommendation of Penny Newman for Riverside County Supervisor Ward 2, and news about our upcoming booth at the Southern California Fair. Reasonable accommodations will be provided for persons with disabilities at this event. Please contact DGR at (951) 394-1357 at least 48 hours in advance to make a request for accommodation or for more information. A Muslim ban. A Wall. A Transgender ban. And now the DACA repeal. In light of recent events in this nation which have sought to divide us through fear, the organizers of #United4Love and the Defend Movement present the #United4Love2 rally. They organized this as a revolutionary act of peaceful resistance against forces that would divide us as a nation. We will come out to prove that out of many we are one; that LOVE is the most powerful force on earth. Stand with us as we demonstrate the power of resistance, the power of unity, and the power of the light to overcome the dark. Let us show the world what America truly looks like, to prove that we are better together than we are apart! #United4Love2 is a #victoryrally! It is a day of testimony, a day to speak the truth and amplify marginalized voices. Come to Memorial Park. Bring your signs, bullhorns, and solidarity. Raise your fists in the air for love, for justice, for victory! We will gather in the park where we will listen to community leaders, artists, musicians, and poets express what it means to be #United4Love. Please leave a comment if you would like to carpool. Inland Empire Resistance has invited us to join them to make signs in preparation for Saturday’s United4Love2 peace rally in Upland. Markers will be provided. We have a limited supply of poster board so please bring your own if you can. For more information on the rally please visit the event’s Facebook page. We will share the specific location of the rally once it has been confirmed. Also, if anyone wishes to carpool to the rally please send me a message or leave a comment. This event is the Executive Board meetings of the Democrats of Greater Riverside. These meetings are open to all paid members. These meetings are for planning the General Meetings of the DGR and to organize support for local Democratic candidates and policies. E-Board meetings are on the first Tuesday of every month at 7 p.m. in the Hacienda Room of La Casa Ortega and will follow parliamentary procedure. If you have any items you would like added to the agenda, please email DGR 24 hours before the meeting. 8:45 pm: Adjournment – Next E-Board Meeting will be on the first Tuesday of the following month; Next General Meeting is on the third Thursday of this month.